Love your wreath! I think it is so cool to see the end result of other people’s creativity! I usually make seasonal wreaths, and change them when they look old and tired. Just bought some stems to give my door baskets a fall facelift!! Just need a few minutes to throw it together!! Thanks again for the pics of the hanging bags! Just love them! Hi Becky – So glad you like the wreath! I had fun putting it together and what’s nice about keeping the base the same is that I don’t feel guilty if I want to change the look a bit by adding new stems when the season comes around again. Hope you post pictures of your door baskets when you’re done! That’s one of the prettiest I’ve seen this fall. Love the Give Thanks tag on there. Wow, Stacey! Thank you so much for your kind comment! I love your wreath!! I know what you mean about the disappointing ‘second season’ of wreaths. I’ve started redecorating some of my wreaths, too. They don’t look this good, though! Thanks for sharing it! Love your wreath. 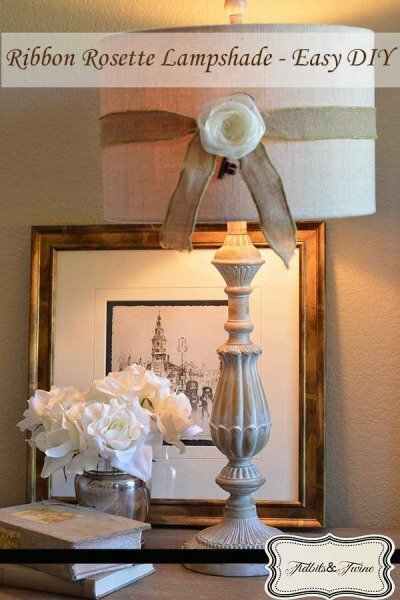 I like the light, airy look of it…now you have me wanting to re-do mine. :) And I LOVE your idea for hanging it. I have a command hook on the door for an indoor wreath, but never thought to put it up high and attach a ribbon for the outside wreath. Great tutorial, too. Hi Babs – Thank you so much for your kind comments! This is the first time I’ve used a command hook for my outdoor wreath but it really works! JoAnn – The wired ribbon definitely helps, as does making sure that each loop is bigger than the one before it. When you get around to trying, if you find that a particular step is confusing, please let me know so that I can revise the description! Whoo hoo! Thank you, Kathryn! Literally did the happy dance around my kitchen with this news! 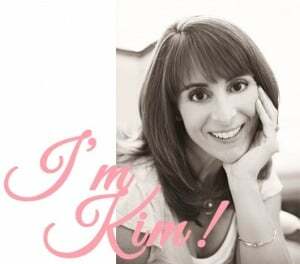 Very pretty, Kim! Your bow tutorial was very easy to understand. 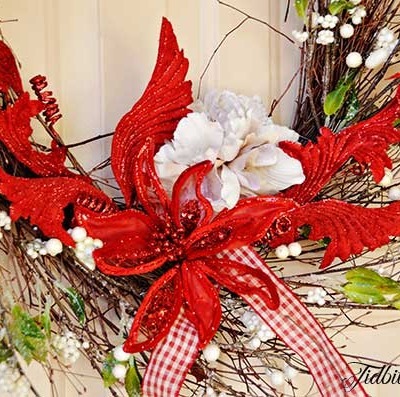 I love the idea of using the same wreath form and just changing out the embellishments. Cindy – I just discovered that you featured my wreath! Thank you so much! Double dance of joy! Beautiful wreath, and a great ideal using the same wreath and changing it out, great tutorial on making a bow. Sandy – Thank you for visiting and taking the time to leave a comment! Linda – Thank you so much! I’m so glad that you found the bow tutorial helpful. Hi Judy – Thank you so much for visiting me from Dwellings and taking the time to leave a comment! I really appreciate it! Thank you for the tutorial. Especially the bow, I’m always rotten with that. Your wreath is simple and not over done. That’s such a beautiful wreath and such a good idea to wire the items in so that you can reuse it each season. I used it as the inspiration for my first Fall wreath. Thanks for the great ideas! Here’s a link to mine. I guess it’s OK for a first try! Hi Melissa – Thank you so much for sharing! I love your wreath and think you did a great job! And wow….that house and porch! So charming! Thank you for linking and dropping me a note to share your wreath. Have a great week! Love your wreath & want to give it a try. Regarding the ribbon for your bow, what would I ask for in order to find this type of ribbon? Thanks! Hi Barb – On this particular wreath I used wired burlap ribbon in the natural color that is 2.5″ wide. This is a pretty common type of ribbon at the major craft stores, especially during this time of year, so you should be able to find it relatively easily. If not, Amazon also sells it. I also wanted to let you know that you can make the bow out of any type of wired ribbon, it doesn’t have to be burlap, but I will say that the wider the ribbon is, the more substantial the bow will look. Hope this helps! how many feet of ribbon gives you what size a bow… Just need a ballpark.. I assume it depends on how many loops and how big you make them…. But for this burlap bow, in particular, how many feet got you what size bow?? Thanks! I’m about to decorate my church’s sanctuary and bought 5yd rolls of red burlap (unwired) 6 inch wide ribbon… Wondering how far they will get me!! Thanks! And because of your post, I may just try to make them myself! Hi Ashley – I had previously estimated about 4′, but I just realized that’s for a 3 loop bow and the one I used in the tutorial is a 5 loop bow, so it takes a LOT more ribbon. You’re right that the length used depends on how many loops and how big you make each loop, but the one in the tutorial is big and used about 10′. Hope that helps! That’s a stunning wreath. I was searching for directions on how to tie a wreath bow, and your directions seem easy to follow. I haven’t tried it yet! Even if I don’t make a bow, I’m glad I found your blog. It’s lovely. Thank you so much and good luck with your project!! I followed your bow instructions today and it turned out great! Thanks for sharing them! Thanks for a clear, easy to follow set of instructions! I am making some last minute Christmas decorations. I haven’t made bows in several years, but your instructions helped every come out beautifully. I’m so glad that these worked for you! By far the BEST bow tutorial I have seen! FINALLY! Whew! I made this beautiful wreath using your easy to follow instructions and it turned out great! I really loved the flexibility of changing out the stems and the ribbon on the hook, let me adjust the length so that I could still see out the peep hole. :-). I love easy bows. This is great and I am pinning. That bow looks fabulous, you certainly make it look easy! Beautiful! I love a good tutorial, and this one is perfect! The wreath is beautiful, and I love how you were able to get double seasons out of it. I make bows like that, but mine never turn out as pretty as yours! I need to perfect my technique! Pretty wreath too! Great wreath. I especially liked your idea of how you hang it. I have that same problem with it clanking, or the hanger keeps my door from closing tight. Thank for the great tip! Loving your work, how much did you use to tie the bow. Just wondering what length to purchase. Hi Zahida – Oh dear I don’t remember!! I purchased a roll of ribbon from the craft store and so didn’t really pay attention to how much I was using. It depends on how many loops you add to your bow and how big you want it to be overall, but I *think* used used maybe 3-4′? So sorry I couldn’t be more specific! I love this wreath idea! I went to the local craft store and couldn’t find the faux stems or berries similar to yours. Where did you purchase these? Thanks for the inspiration! Thanks for the reply. One more question if you habe time to reply. How many stems of the berries did you need to purchase? Thank you!! Hi Marie – For this wreath, I think I ended up using two pussywillow stems and three stems of berries, but it really depends on what stems you use and how full you want your wreath. WONDERFUL to see I am doing it wrote . It never hurts to see how other people do thing . Thing you so much. Thank so much for sharing – your wreath is stunning!!! I have been trying to replicate but am having trouble finding materials that look as nice as what you have, especially the greenery. Was that something you got at Michael’s also? Hi Gina – So sorry for the delay in responding! Yes, I believe I found the greenery at Michaels as well. Actually, I have pretty good luck finding stems at Michaels that I like, but they can be pricey so I always wait for a sale or use a coupon. Good luck!